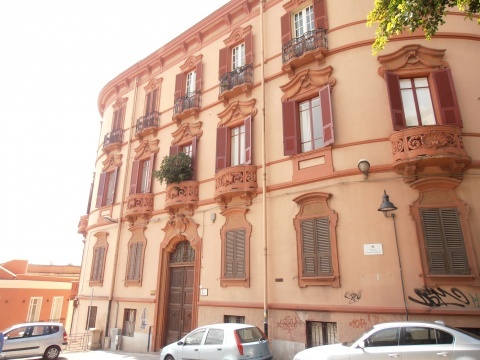 This building stands in a wide area between Viale Regina Elena, Piazza Marghinotti and via Sulis. The construction of the building took place in two different periods. The engineer Niccolò Mura conceived the project for the first block erected between 1901 and 1915, facing the side of the Bastion of Saint Remy. The engineer Riccardo Simonetti is the author of the project concerning the extension of the façade that extends to Piazza Marghinotti, which took place in 1926. After the bombings of 1943 the palace suffered extensive damage and was the subject of an accurate restoration work after the war. The two blocks are entirely different from each other even if the extension works did not result in substantial changes in the architectural style. Also the materials used for the two sides are different: granite, limestone in the base and clay for ornaments in the part that faces Viale Regina Elena; concrete aggregate and cotto for the façade in front of Via Sulis and Piazza Marghinotti.